Every year when this time period comes around, my heart is so conflicted. Yes, it’s very sad that we have just one NFL football game remaining between now and September. Everybody knows the Sunday Scaries increase tenfold when you can’t ignore all your problems and watch nine hours of football every Sunday. But at the same time, shouldn’t we enjoy this time of year while we have it? Super Bowl Sunday is a top five holiday for any true red-blooded American. We eat, we drink, we watch funny commercials, and we (spoiler alert) watch the Patriots win it all yet again. And, if you’re lucky, maybe you make a few bucks along the day. 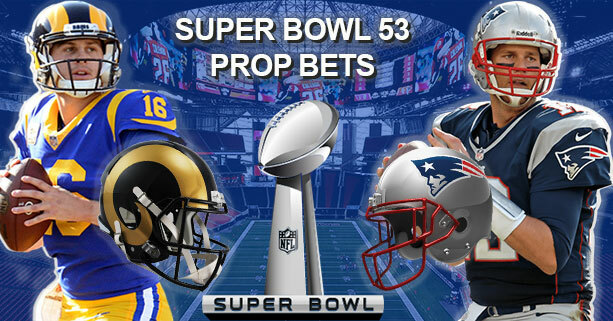 I always have a good handful of bets going for Super Bowl Sunday, and along with the typical game spread and over/under, the Super Bowl is known for its outrageous and sometimes controversial prop bets. Each year has some repeats: the over/under for the National Anthem, the coin toss, the color liquid poured on the victorious coach, etc. But each subsequent Super Bowl brings with it new storylines and new things to watch out for, and this year is absolutely no different. Bovada is consistently my go-to source for the best Super Bowl prop bets, so I’ve been checking there periodically since the Conference Championships ended to see what we’re working with this time around. Here are the props I’m keeping an eye on. Listen below or subscribe to The Fantasy Fullback Dive to hear the Roto Street staff discuss their favorite Super Bowl 53 Prop Bets. The Patriots have been designated as the road team in this Super Bowl, so once again they’ll be calling the opening coin toss, and likely calling heads. Obviously this comes down to a 50/50 chance, but I’m feeling heads on this one. 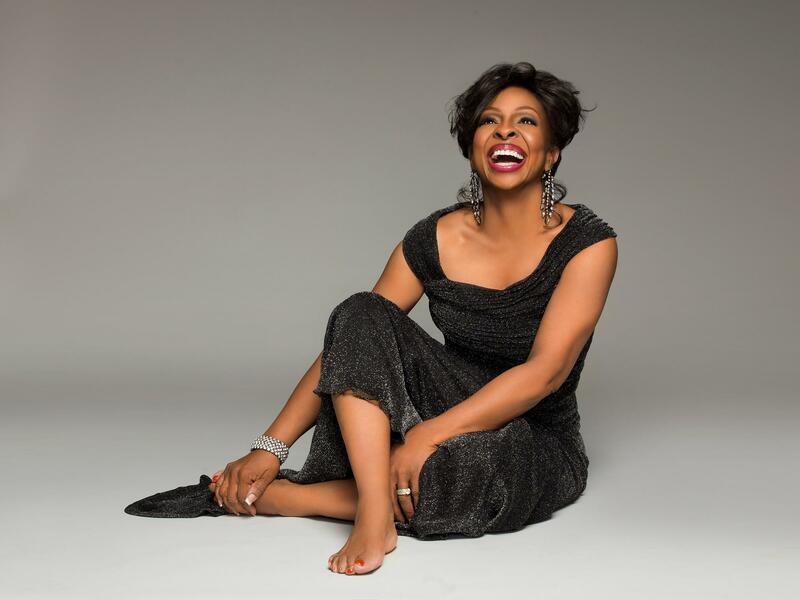 Gladys Knight has been chosen for this year’s National Anthem, and she’s a great choice. She’s a Georgia native and one of the most talented soul singers of all time, and she’s indicated on several occasions that she’s incredibly honored to be performing this year’s anthem. There’s not too much tape on her previous anthem performances, but I was able to find this one from 1991. In this rendition she times out at about 1:32, which puts her 15 seconds under this year’s over/under. Despite this evidence, I think all of the pageantry and spectacle of this particular occasion will add some time. She also has an incredible voice and can hold a note like nobody’s business, so I struggle to go against the over here. Also, the last 6 Super Bowl anthems have gone over 1:47, as well as 9 of the last 10. It may be going against the tape, but I’m taking the over on what is consistently the most exciting prop of the night. This wasn’t an obvious choice, especially since my research has shown that my girl Gladys can absolutely slay a pantsuit. But she’s gone with a dress of some kind for most of her performances even as she’s gotten older, and for such a momentous occasion I think she’ll bring out the big guns. Other isn’t an awful choice here given the odds, but skirt/dress/gown is the safe bet. Let’s be honest: Tony Romo didn’t receive the warmest reception when he first got into the broadcasting game last season. It’s been an uphill battle for him, basically getting teased and mocked on every corner of the internet, but this year’s AFC Championship was his Mona Lisa. He was calling so many plays before they happened, he actually inspired a conspiracy theory that he’s tapped into the coordinators’ headsets and hearing the play calls. And now, as he rides his hot streak into Super Bowl 53, he’s gonna want to continue the magic. Also, I honestly believe he’s not trying to come off like a genius by predicting plays, he’s just noticing stuff that only a quarterback notices and pointing it out to an audience of millions. I don’t see that stopping, so I’d hammer the over here. How many times will Ted Rath (“Get Back” Guy) be mentioned during the broadcast? Believe it or not, I feel like the under here is the safer pick. Obviously Ted Rath, AKA the Rams’ Strength and Conditioning Coach/Sean McVay’s “Get Back” Guy, is going to be mentioned by the broadcasters and shown during the game. But four times is pushing it for a game that will not be struggling for storylines, and I feel better about 2-3 times here. HAMMER THE OVER. This is the largest coaching age gap of a Super Bowl ever. That alone is worth at least a mention. And announcers just love to talk about how young McVay is, especially since he’s facing a QB that’s almost a decade older than him and a WR that he played against in college. -175 is no fun to bet on, but hammer the over and take the guaranteed money. Before you say it, yeah, my pick is Tom Brady. It’s the safe pick. Virtually every time the Patriots win the Super Bowl, Brady is the MVP. Over half of all Super Bowl MVPs (29 of 52, 56%) have been the winning team’s QB, and Brady has taken home the honor in 4 of his 5 victories. So he’s my ultimate pick, but obviously I’m going to throw out some alternatives. First, as you should know, it really depends on who you think is winning the game. Just 1 Super Bowl MVP has come from the losing side, and there’s virtually no chance it’ll happen again. 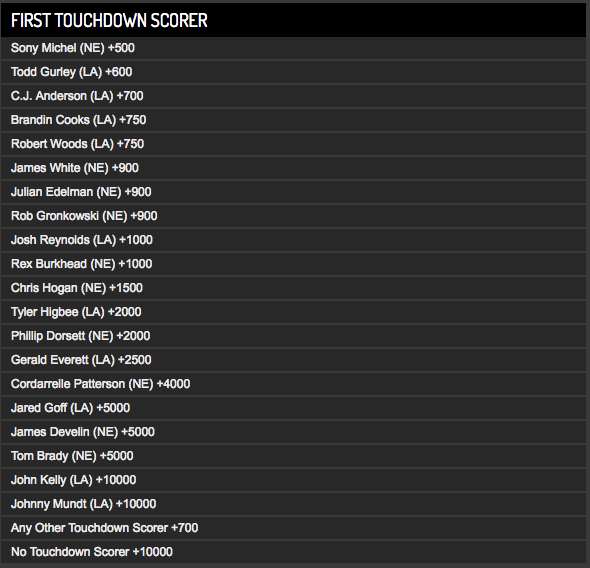 So on the Patriots side, I love both Julian Edelman and James White at 20/1. One could argue White should’ve been MVP of Super Bowl 51, and he’s an incredibly important part of New England’s offense that will undoubtedly put up numbers in this one. Same goes for Edelman, who is Brady’s go-to guy on third down and could surpass his QB for MVP honors if he makes a few big plays like he did in SB51 or this year’s AFC Championship. For the LA side, aside from Jared Goff, who makes the most sense, I’m leaning toward Robert Woods at 50/1. I wouldn’t agree that he’s “arguably the best receiver in football” as Troy Aikman emphatically declared earlier this month, but he’s a very big part of the Rams’ offense both in the passing game and on the ground, and a few big plays out of him could propel the Rams to a win and have him taking home MVP honors. 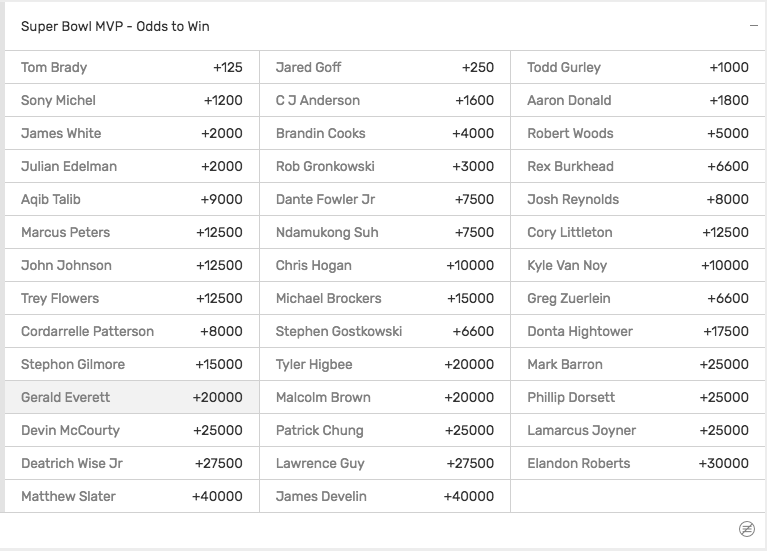 Bovada dropped the ball on this very popular prop, so these odds come from OddsShark instead. This is a great one because even if you play it safe and go with the odds-on favorite in Sony Michel, you’re still getting 5/1 odds. Personally, I wanted a real longshot, and I went with Cordarrelle Patterson. 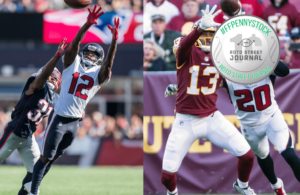 Patterson was virtually ignored in New England’s AFC Championship victory, being targeted just 4 times and finishing with 2 catches for 18 yards, while recording zero rushing attempts. 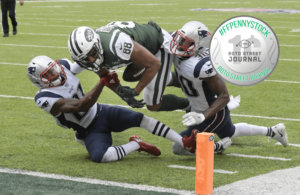 The Patriots have gotten real creative with Patterson’s usage this season, getting him into space with screens or jet sweeps and letting him use the speed and elusiveness that have made him an All-Pro kick returner. I think he’ll be used a lot more in this game than last, and it could start early. If you’re feeling the Rams, aside from the 2-headed monster of a backfield I’d look at Gerald Everett at +2500. The Rams love looking to their athletic TEs in the red zone, and Everett is a big body that plays that role well. While New England is focused on stopping the elusive backs and speedy receivers, Everett could make a splash early in this one at 25/1 odds. Will any QB throw for over 400 yards? I like the underdog here because of history. Tom Brady has averaged 485 passing yards per game over his last 2 Super Bowls, and despite the Patriots having a bit more of a running game than they’ve had in the past, I still think they’ll be very pass-heavy in this game. And who knows? Maybe we get a 45-40 game and both QBs go over 400. Will a player be ejected for throwing a punch or fighting? If you’re looking for a longshot to grab some big money, look no further. Especially if you think the Patriots are going to win. This is an inexperienced, young Rams team, and oh yeah, they also employ Ndamukong Suh and Aqib Talib. If you don’t think there’s a decent chance the Rams find themselves down 21 late and Suh takes his anger out in the form of a stomp on Brady’s leg, you’re crazy. On top of all that, this is the biggest game of most of these guys’ lives: tensions are high, and sometimes that boils over, regardless of the score. It’s not the safest pick, but it could be a great return; plus, rooting for an ejection is pretty exhilarating. What will the first turnover of the game be? This one just caught my eye and I’m confused why INT is such a heavy favorite. Yes, these are two passing offenses at heart, but both have run the ball very effectively all year. 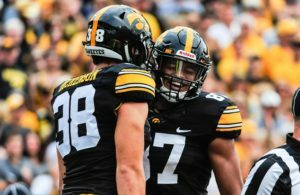 And both will likely want to establish their running game early to open up the rest of the offense. Combine that with nerves and some inexperienced ballhandlers, and I don’t see why the first turnover couldn’t be a fumble. These teams forced a combined 30 fumbles over the course of the regular season; I’m thinking we’ll see another early on Sunday. Analyzing this prop isn’t as much identifying their best or most popular song; a big part of it is the intro to the song. One that makes sense for them to be just getting into as the lights come on and the camera pans from the top of the stadium down to the stage. One More Night is a pretty popular and recognizable Maroon 5 song to start with, but the start of it (basically just a bunch of “ooooo”s) would be a logical start to an upbeat concert. I like it at +550 here. Will either team hit a crossbar or upright on a field goal or extra point attempt? Another underdog here that could make you a few bucks real quick if you want to go with it. It’s #DoinkSZN people, and while both team’s kickers are very talented, crazy things happen in the Super Bowl. Let’s not forget Stephen Gostkowski‘s missed PAT during New England’s Super Bowl 51 comeback that forced them to go for two, twice at the end of the game. If memory serves, this miss was a doink off the right upright. Between Gostkowski and Jake Elliot in last year’s game, we had two missed PATs and a missed 26-yard FG. It’s solely a gut call, but I like this one. Personally, I think Teammates is the safest choice here, but I’m not just gonna feed you guys the favorites; I know you expect more of me. Especially if MVP favorite Tom Brady takes home the honors, Family (Giselle) should be right up there with Teammates. They’ll both be mentioned, but could go in either order. God is always an interesting bet because it depends heavily on the winner, but if you want to risk a little here, steer clear of Teammates and go Family. What color liquid will be poured on the winning coach? This one’s a tough one, but again comes down to who you think will win. The popular choice for NFC victors in recent years has been orange, so if you’re feeling the Rams, that may be the place to go. For the Patriots, either due to the nature of the end of the game (SB51 OT win) or just lack of excitement/flashiness, Bill Belichick has only had a Gatorade shower in 2 of his 5 Super Bowl victories. The first was over a decade ago, which was clear, and the most recent was after Super Bowl 49. That last one was blue, which leads to my pick here. It’s a total toss-up, but Blue at 4/1 is my pick here. And that does it, folks. For the record, if you hadn’t picked this up already, I’m on the Patriots -3 for the more “traditional” wagers, as well as Over 56.5. These are two strong offenses with a lot of starpower, and the Patriots last 2 Super Bowls have gone well over this mark. Happy wagering to all, and make sure to keep an eye out for our Super Bowl 53 Prop Bets Mega Episode of The Fantasy Fullback Dive coming later this week.